And you’re reading my uncensored review of what I really thought about Holosync Meditation. Why am I writing this? Well, when I was thinking of buying Holosync, there weren’t many authentic reviews around. So, I thought I’d do a quick write-up to help any of you who are in the same position I was. But be warned, I’ll be going into the good and the bad points of Holosync Meditation, so if that’s not something you want to read, you might may as well leave now. I first discovered Holosync back in 2004. I was fresh off a 10 day silent meditation retreat in India with my teacher Sri Karunamayi and wanting to go deeper into meditative practice. But meditating on my own wasn’t working that well for me. I decided to look for meditation teachers or retreats in my area on the internet. What I found as I browsed was a small ad that said “Meditate Deeper Than A Zen Monk.” Normally I wouldn’t click on such an ad, but the title pulled me in to the Centerpointe Research Institute’s (makers of Holosync) website. At first glance I was impressed by the professional quality of the site as well as the testimonials by users of the program. I was still skeptical when I downloaded the sample audio and listened to it. But then, as I listened, I noticed that my thoughts calmed down a lot. That that was enough for me to purchase the first level. Since that time, I’ve used Holosync meditation nearly everyday. Practically, what that means is that I’ve listened to Holosync audios that automatically put my brain into a meditative state for either 30 or 50 minutes a day for the past several years. I have to say that when I came to Holosync my life was pretty unfocused and ungrounded. I felt like I was floating through without much direction. I also struggled some with depression. Holosync didn’t change these things overnight for me. But gradually and over time, I started to notice that I was thinking clearer and behaving with more dedication and focus. The feelings of depression also started to lift and eventually disappeared totally. Now I feel focused and grounded and very happy to be doing the work I do. Without Holosync, I’m sure I wouldn’t be in such a good place. To meditate effectively you don’t have to isolate yourself in a cave somewhere. 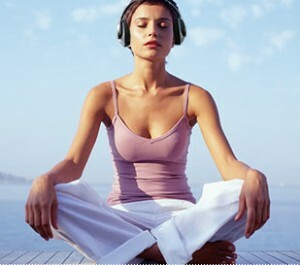 Upheaval or feeling emotional after meditation can actually be a very positive thing as it means that you are growing. Meditation is not the end goal. Beyond that there is a lot of living and serving to do. Gentleness, kindness, and compassion start with ourselves. Meditation can help you achieve this and then share it. Meditating with Holosync means that your personal growth can be greatly accelerated. I remember when I first started using the program I had some really powerful experiences. After listening the the audio I would often feel like I felt when I left my silent retreat in India. I questioned the Centerpointe staff about this and they told me that this was most likely because of how effectively Holosync puts your brain wave into Delta frequencies. These slower brain waves are apparently where the deepest and fastest healing happen. What’s great about Holosyc is that just by listening to the audio your brain has to go down into Delta. You simply can’t make a mistake with it and nothing is left to luck or guess work. I love that. I want to say that everyone would benefit from purchasing Holosync. I’ve seen many of the people closest to me have wonderful success with the program. For a couple of friends, I think it was too much, too soon. I’d say that for anyone with a true, sincere desire to expand their potential and realize their dreams, Holosync is a must. But for people with major emotional trauma issues or psychological issues, Holosync may not be the best choice. That’s because of how quickly it works. If you have any of these types of issues you should really have the support of a psychologist familiar with the program before trying Holosync. I have no complaint about anything being left out of the program at all. The program is complete. Plus, I’ve found customer support to be in general very good and responsive. But I have heard from some friends that they wished they could get even deeper levels of support. These are folks that have had some emotional troubles and would need a counselor with Holosync experience. That’s something I’ve suggested they add to the program. As I’ve mentioned earlier, in my case, it certainly wasn’t overnight. But within 1 month I already started noticing some changes. I was kinder to my wife and friends an I also felt more relaxed than I had in a few years. Meditation is not a quick fix, but in my experience it is a permanent fix. It may take a while to get to the peace and clarity that is your birthright, but you’ll get there eventually with a consistent meditation program. Holosync just speeds the process up – a lot in my experience. I can give you one story about a friend who organized teacher training events for Yoga. During the 6 week trainings he has his students listen to Holosync every morning. Now, there’s a lot packed into the six weeks, but the one thing that almost all the students view as a highlight is the morning meditation. It works so well that he’s been using it for over 5 years now. After using Holosync in the beginning or after going to a new level you may experience some uncomfortable emotions during the day. Maybe you feel a bit depressed or are quicker to get angry. This is a normal part of Holosync and is handled very well in the materials included with the program. For most people, me included, these feelings go away quickly and permanently in many cases. You do need to have a way to play an audio CD and a quality pair of stereo headphones. The last pair I bought cost about $50 and I usually just play the CD on my laptop. Beyond these things, you only need willingness. The “Holosync Solution” is truly a solution to problems like being stuck in a rut or repeating similar experiences over and over. The technology pushes you forward and gets you moving toward more expanded and positive experiences. I’ve done all sorts of personal growth work: Yoga, Reiki, Meditation Retreats, Landmark Education, The Work, and so on, but Holosync stands out as the most effective long term approach to real and permanent change. If you’re searching for something similar, I encourage you to check the program out for yourself. By the way, Bill Harris offers a money back guarantee that is solid as a rock, so there’s nothing to lose at all. i used 2 use holosync in 2006 daily. Traumatic events have forced me to put them aside. I would like to resume but I don’t know where to start. I was almost finished with awakening prologue. Do i start at 30 minute meditation or do I jump into the hour daily where I left off? pls help. I would contact support@centerpointe.com just to be sure, but after I started back up I was at 30 minutes first then moved up to an hour. WOW – I just reintroduced myself to your website – for thoroughly different reasons than meditation – and found you talking about Holosync. I purchased level 1 back in 2005 (after REALLY checking it out). I even contacted former co-workers who were anesthesiologists, neurosurgeons and even the pulmonary guy who did my sleep study (for apnea). They ALL said it was legit science. I gradually felt profound effects and eventually worked up to Immersion 2.5. Unfortunately, with moves, etc., it kind of got put on the back burner. Just 3 nights ago I fired up The Dive to go to sleep to and after the third night that beautiful, restful sleep took hold again. BTW – I quit using the CPAP contraption a year ago. I’m contacting Centerpointe ASAP to get back on track. This was actually something I was going to ask you about several years ago!! I found Holosync back in 2004 and followed the program for 5 years. What I love about it is that it is a foolproof meditation – the brain waves simply have to be lowered. I stopped shortly after Aureya was born as it just felt time for a break. I think I went all the way through the 4th level of the second stage (purification). I do still regularly use some of the other programs like “Oasis” and the “Compassion Meditation” and I’m thinking about picking up again. I credit the program with helping me function much more clearly and with helping me overcome some obstacles that kept me from experiencing inner peace. I often recommend it to people who are ready to get into meditation but don’t know quite where to start. Such an easy, non-religious introduction. Also, really cool to read in your comment that you Doctor friends confirmed the science. Are You Curious About Sleep Tracks by Yan Muckle? Next post: What Is Yoga? What Juice Cleansing Is About. Are You Curious About The Jump Manual?